So I wouldn't normally use pink for Christmas, but I quite like the result. This card is my final Caardvarks DT card for the current challenge. 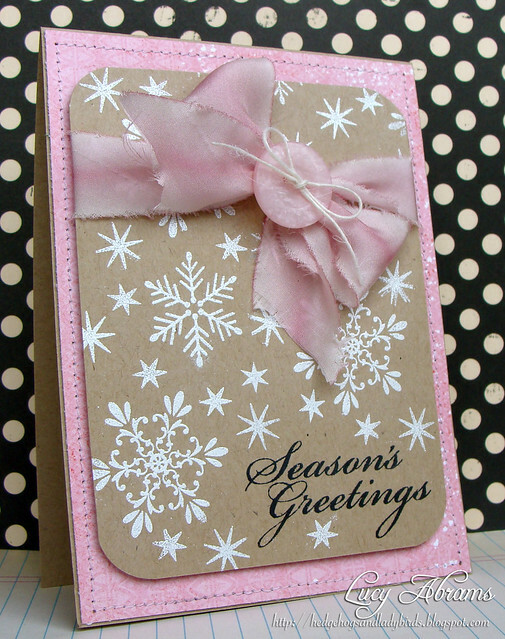 The large snowflakes are from THIS set, and the small snowflakes and greeting are HERE. Oh, and THIS pink patterned paper is delicious. Unconvential colour for a christmas card...but it is sooo beautiful ! Love your pink Christmas card. Seeing the paper made me think - did you get to go to an Archiver's while you were here? Beautiful! Love the pink! Pretty ribbon! I like it, I like it a lot and that ribbon is gorgeous. What a lovely card !!! Very unusual colours, but I love it ! Hi Lucy, Actually I was waiting to see your Pink Christmas card and I have to say its Gorgeous. Love your ribbon and the dreamy effect of the card. TFS. I love the non-traditional color combo! SO very pretty!!! You're going to make everyone re-think pink for Christmas, because this is just lovely! My mom always used to decorate our formal living room with tons of pink each year for Christmas, so it is very normal for me. . .and I LOVE it! Reminds me of my childhood! Beautiful, Lucy! That is just beautiful! I like that it's not typical Christmas colors. This is so pretty! It has that romantic appeal to it as well with the ribbon. Love to see pink and pastels for the holidays! I love, love, love this card Lucy, those colours together are too beautiful. I'm lovin' this! I would never think pink for Christmas either, but now I just might! Thanks for the inspiration! so pretty! such a unique color for a holiday card. love it!